Affinity purified against recombinant protein GST- PARKIN [DU 8102] and then depleted against GST. HEK293 cells were either transfected with HA empty vector or HA-PARKIN. 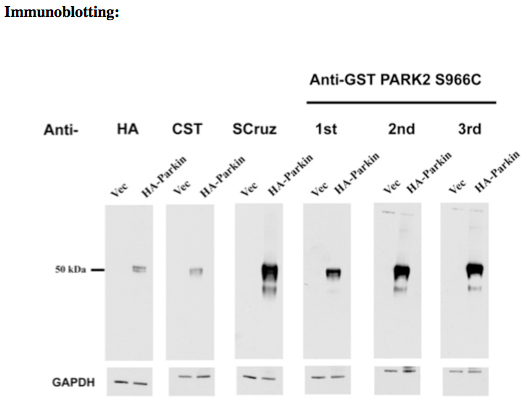 12.5 ug of cell extract was subjected to SDS-Page analysis before being transferred to nitrocellulose membrane and immunoblotted with anti-PARKIN (PARK2) S966C. In parallel lysates were also probed with commercial antibodies: rat monoclonal anti-HA (Roche), rabbit polyclonal anti-PARKIN (CST) and mouse monoclonal anti-PARKIN (Santa Cruz). Parkin was immunoprecipitated from 0.5 mg HEK293 cellular extracts over-expressing empty vector or human wildtype HA-Parkin. 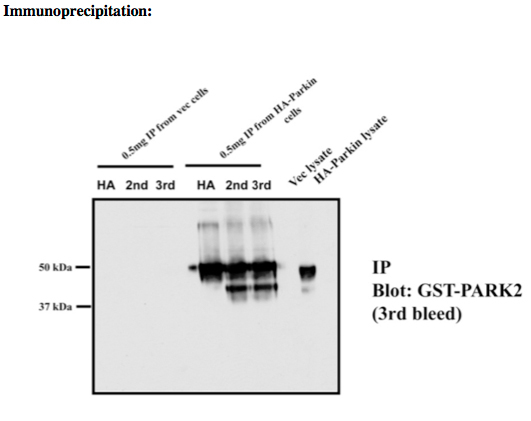 Immunoprecipitates were performed using 5 ul of HA-Agarose (Sigma), 5 ug anti-PARKIN S966C covalently coupled to protein G Sepharose. Immunoprecipitates were subjected to SDS-PAGE analysis before being transferred to nitrocellulose membranes and immunoblotted with anti-PARKIN S966C.